Anne Couyoumjian focuses her practice primarily in tort defense litigation, including cases involving products liability, toxic tort, chemical exposure, transportation, fire litigation, construction defect, and general liability matters. She regularly handles arbitrations, mediations, and litigation in both state and federal court. Ms. Couyoumjian is engaged in all phases of complex litigation, including drafting pleadings, motions, memoranda and briefs, discovery depositions, arguing motions, alternative dispute resolution and all aspects of trial preparation and trial. Ms. Couyoumjian has defended product liability matters for manufacturers of products ranging from exercise equipment to medical devices, representing small, privately-held companies, as well as Fortune 500 corporations. She is a member of the national defense team for one of the firm's largest self-insured clients, requiring pro hac vice representation throughout the country. Ms. Couyoumjian was recently involved in a successful appeal before the First District of the Appellate Court of Illinois, Kilburg v. Mohiuddin, et al., in which the court affirmed the trial court's dismissal of spoliation of evidence claims against her clients. On numerous occasions, she has successfully obtained summary judgment in favor of her clients on claims based upon theories of agency and respondeat superior. 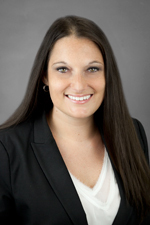 Ms. Couyoumjian joined Hinshaw & Culbertson LLP as an associate in December 2007. Previously she was a law clerk with the firm since May 2006. While in law school, Ms. Couyoumjian clerked for Tabet DiVito & Rothstein, LLC, and prior to law school, worked as a legal assistant at the Law Offices of Lawrence & Morris. She also participated in the City of Chicago, Mayor’s Office Summer Fellowship Program in 2005, where she worked with Mayor’s Office senior staff on policy issues and was a member of the Law Department Outreach Committee. Prior to her legal career, Ms. Couyoumjian was an account manager and the General Manager of Sales for A&M Specialists, Inc., a marketing and public relations firm based in Detroit and specializing in the automotive industry. In addition to her other law school accomplishments, Ms. Couyoumjian was a member of the Dean’s List and an academic tutor for legal writing. During her undergraduate studies, in the Spring of 2000 she participated in the Wells College Program of Lorenzo de’ Medici University in Florence, Italy.